English text is at the bottom of this page. I see from the opposite bank of the waterway. The midwifery facing the sea, the Seto Ohashi bridge and Shikoku spread far. I see the maternity clinic over the waterway. Choose a golden roof plate in a shape responding to the glow of the water surface. Sea side façade. 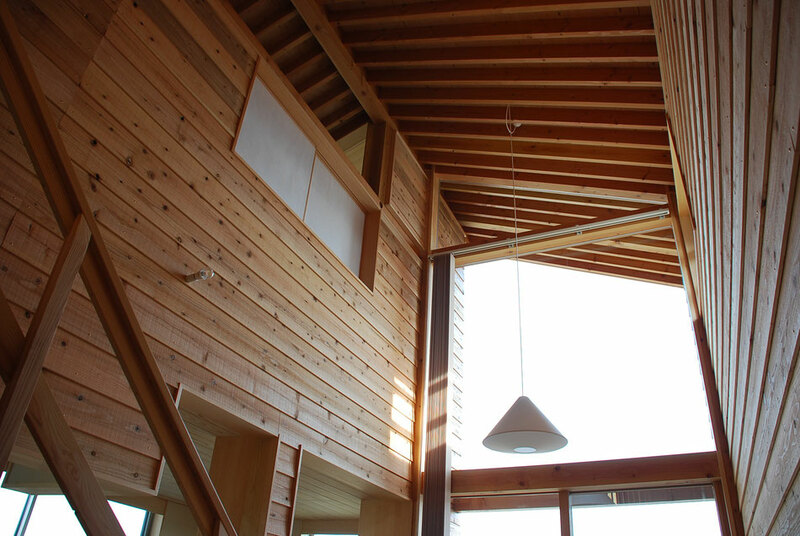 Large openings are arranged so that any room can view a superb view of the sea. 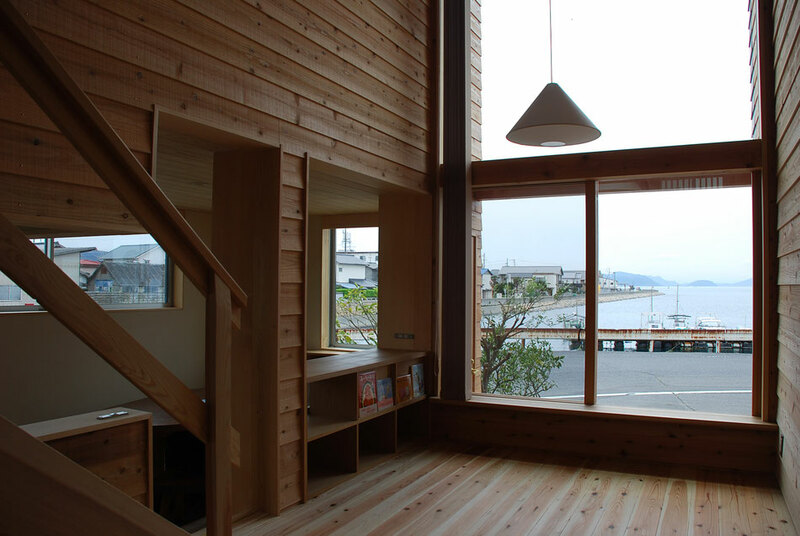 The right end on the second floor is a bathroom with a view of the sea. Northern façade on the entrance side. Right edge striped parking area. Climb the slope and it will be the entrance. 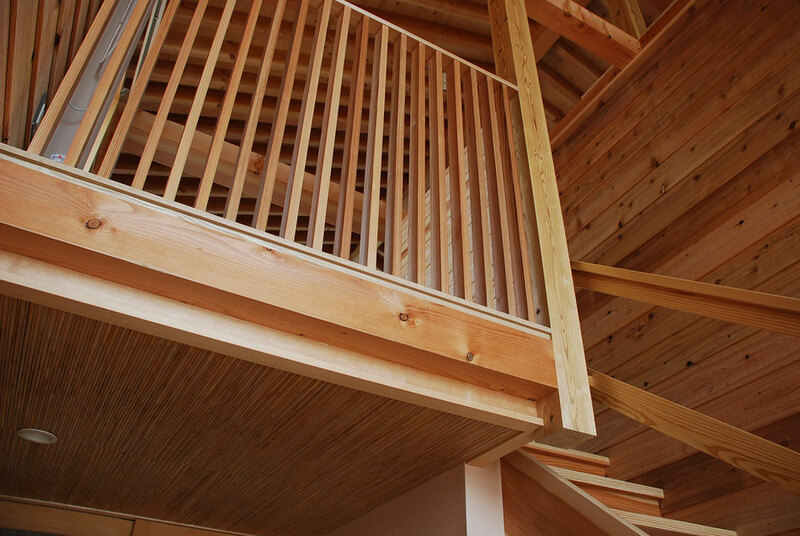 At the top of the slope the eaves greatly stretch out, and it is a large roof to welcome visitors. entrance. 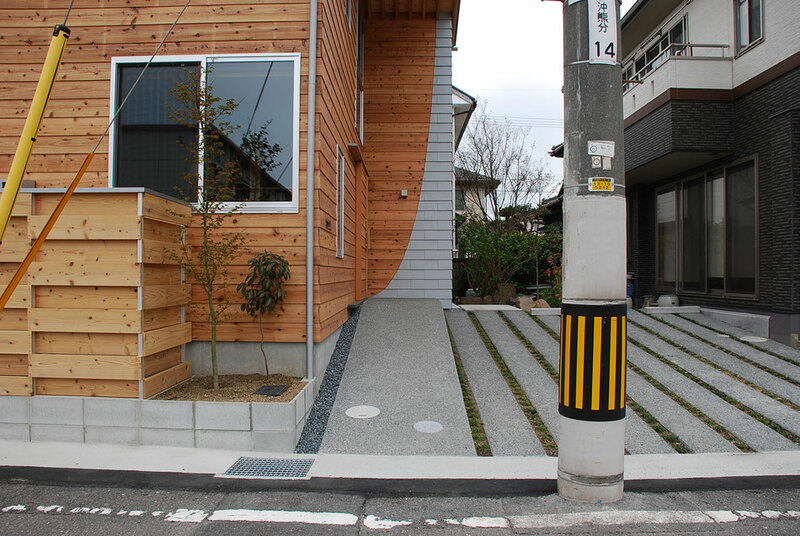 The slope surface is a rough surface and it is supposed to be a slip stop. 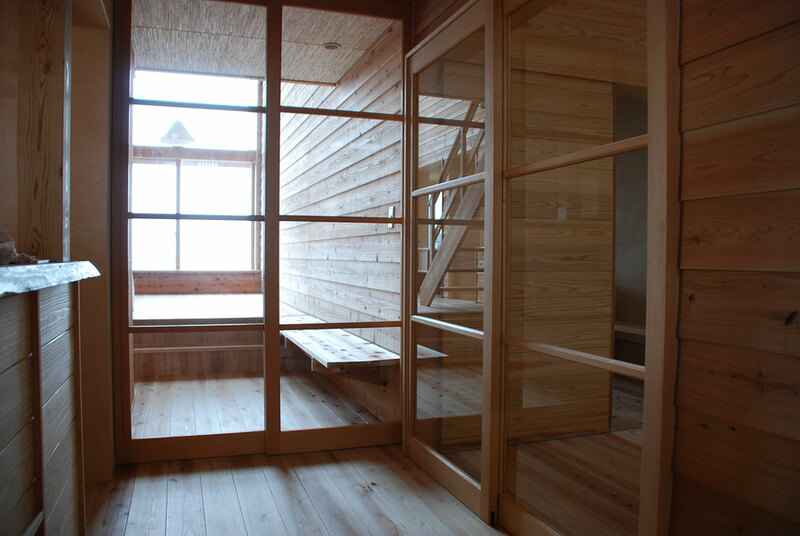 The sleeve wall that protrudes to the center serves as a barrier, and gently separates the front and back. When approaching from the front, the sleeve walls and the sheet metal design of the sleeve walls imply the entrance position. Equipment is hidden in the checkered wooden board part on the left side at the front. 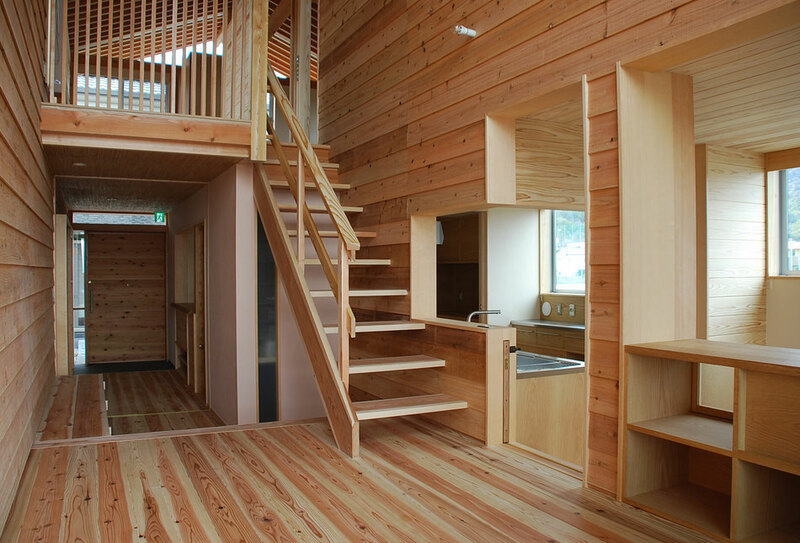 An interior space covered with wood. 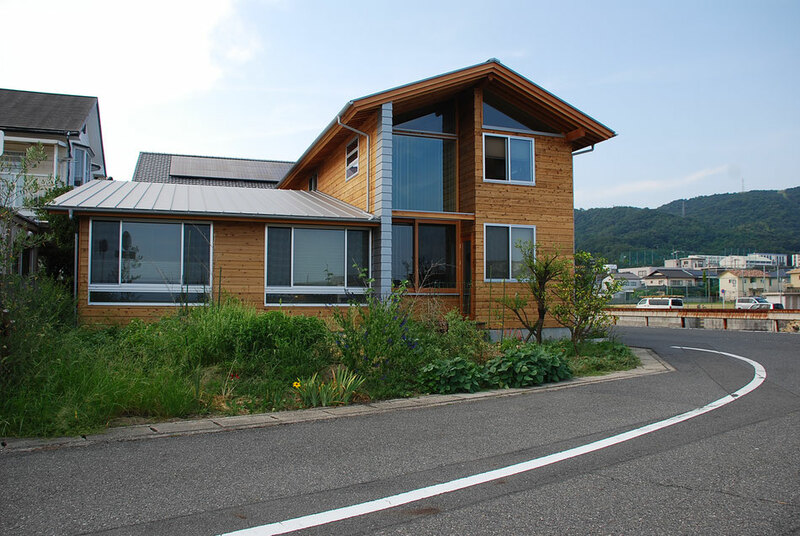 The Seto Inland Sea extends from the front window in front of you. The inner wall is the same glance as the outer wall. Reception counter. 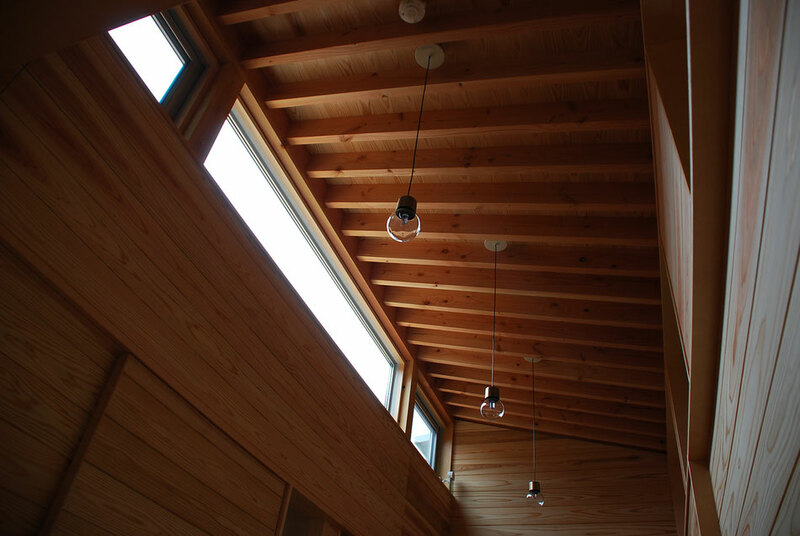 Wood boards and plaster are soft and reflecting light. 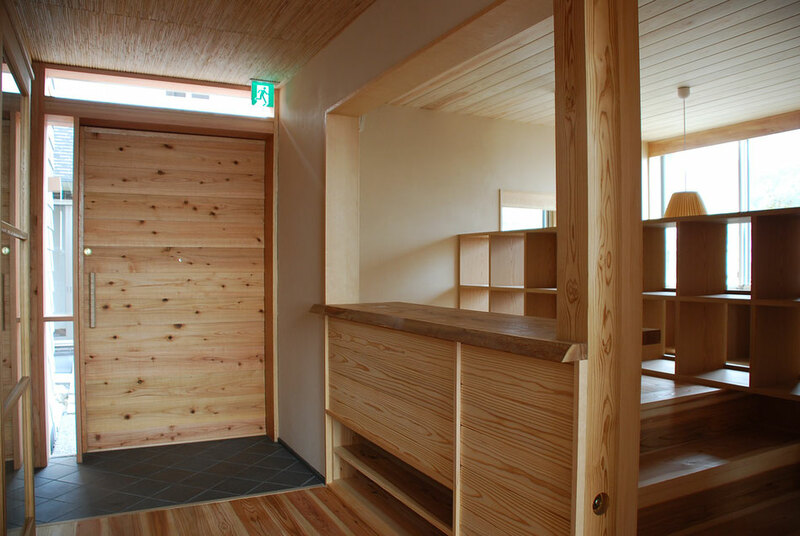 The interior is a shared toilet. 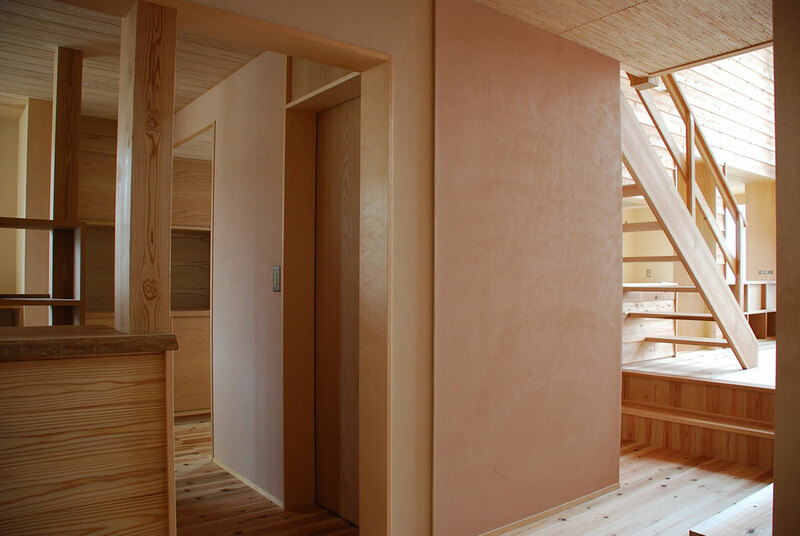 Divide the paint of two color plasterings by the door of joinery jutting out thinly. Various materials are obscured / hidden. Glass fittings with horizontal crosspieces. I look at the delivery room side from reception. There is a small window through which you can see the entrance side from the delivery room. Light is inserted from the high-side light on the upper corridor on the right hand. 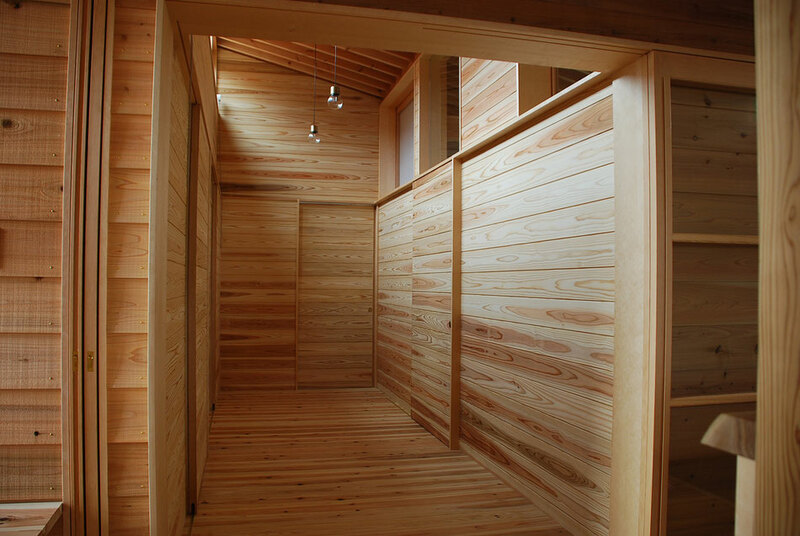 Space covered with cedar board. 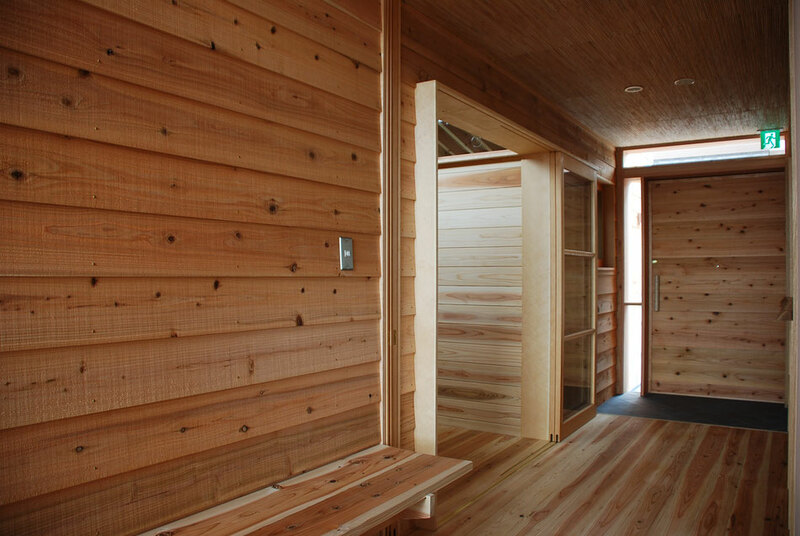 The smell of wood wraps the interior. 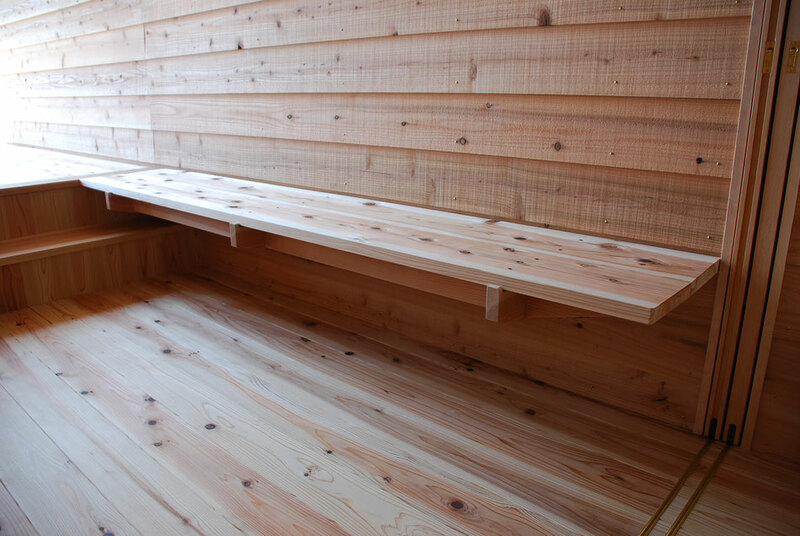 Cedar bench. It has a slight inclination towards the center, making it easy to sit. The wood board of the wall has a sawing finish and gives a sense of texture. A place where mother and baby gather always. This place is always a popular place. Looking up at the ceiling of the hall. 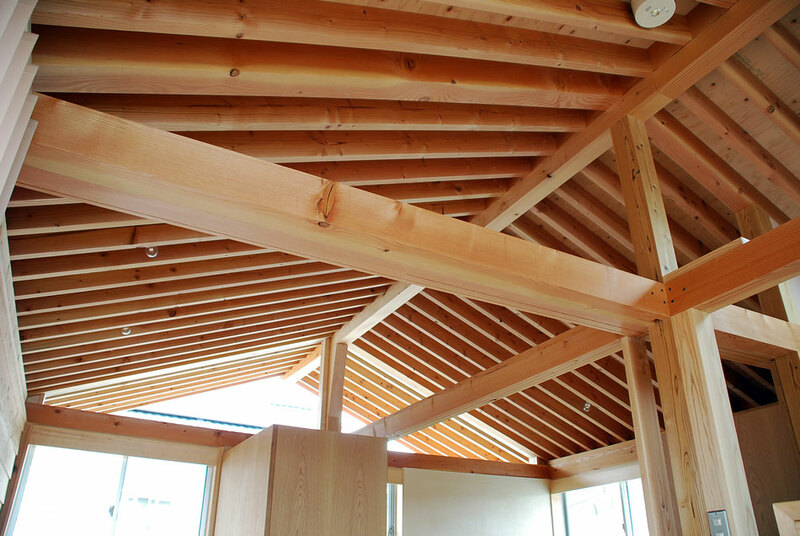 The continuation of rafters will continue to the outside. 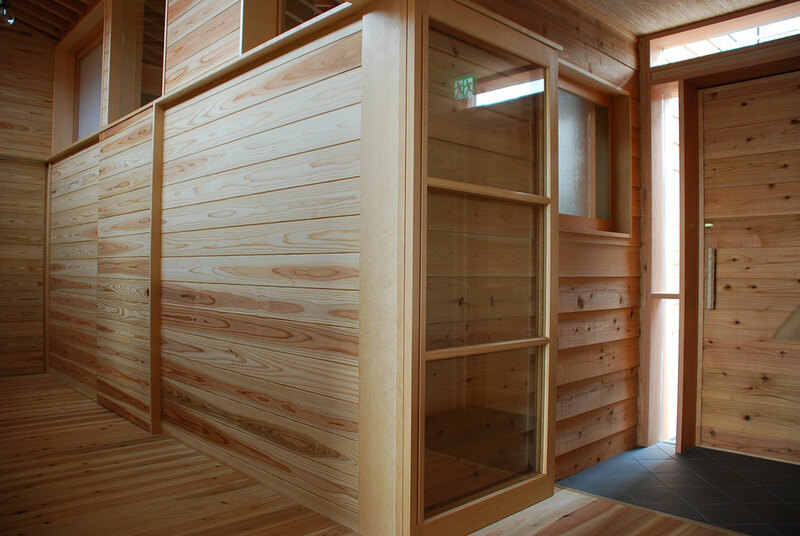 The room with a shoji in the upper left is a room to perform a massage. 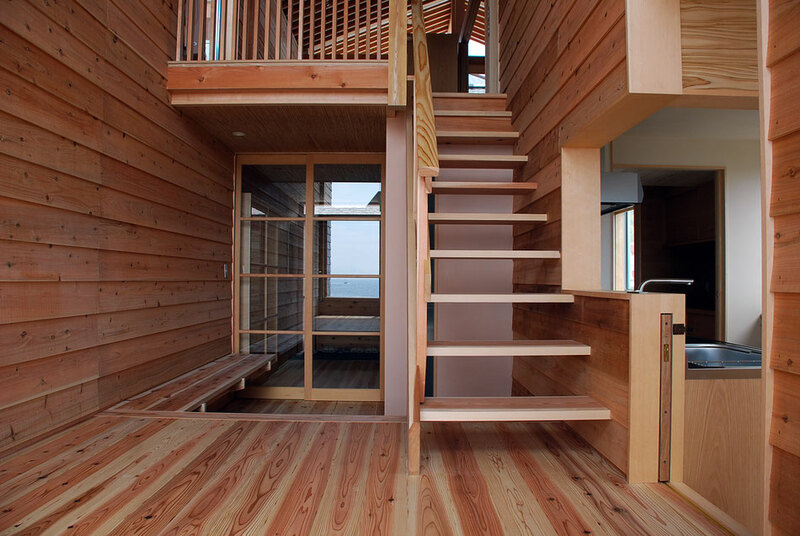 Look at the stairs going up from the hall to the second floor. Moms gathered in the hall often see the room from this perspective. A staff stands in the kitchen, talking with customers while cooking. I look at the entrance side from the corridor. 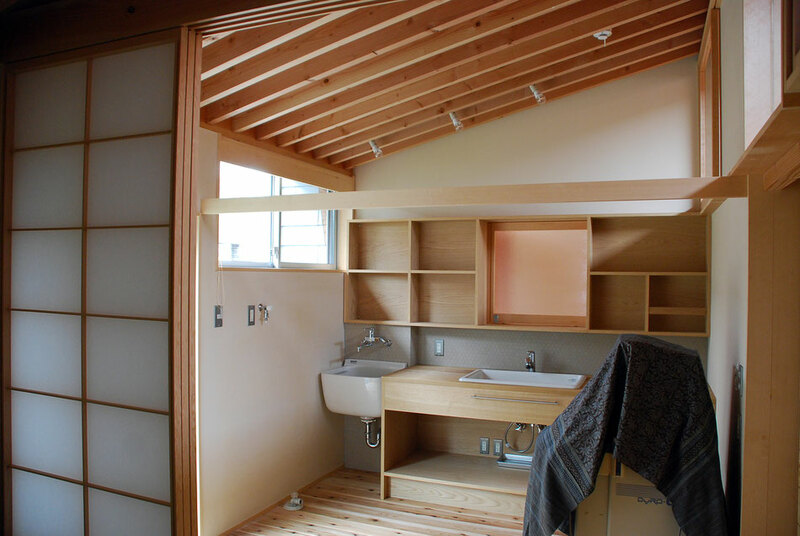 The sliding door in front is made to be able to be stored in the wall. Looking back at the entrance. Assuming the use of emergency transport trolleys and strollers, the front door and the floor are made flat. Shoes departure place is shown only by difference of material. A corridor which goes to the accommodation room and the delivery room. 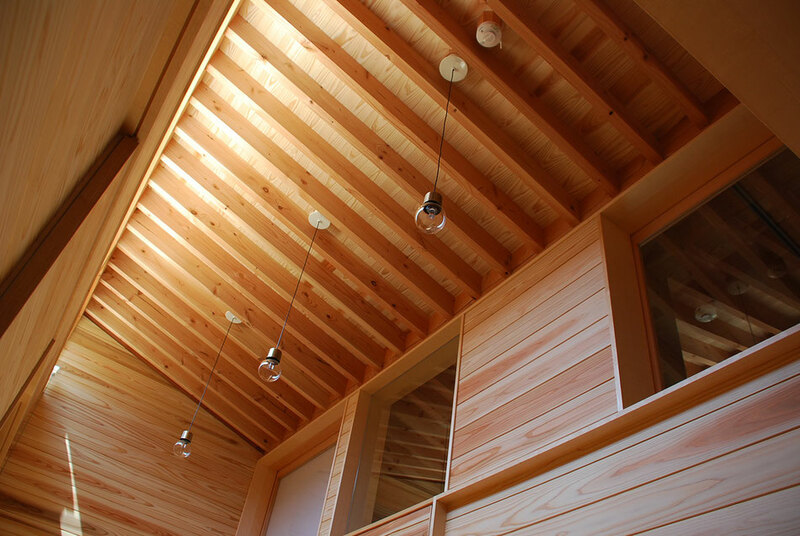 It is a place that tends to be dark in the central part of the building, but it also makes the light fall down to the north by the high side light.All wall finishes are cedar boards. The fittings are also in the same finish. High side light in the upper corridor. Lead the light to the corridor and delivery room. The state of the upper part of the hallway as well. The right hand passes light through the delivery room through the glass door into the delivery room. 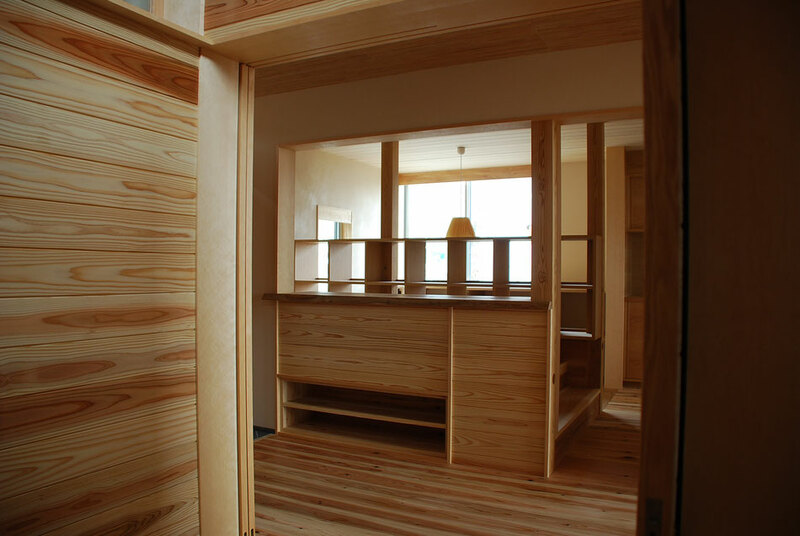 I look inside the accommodation room. By the light reflected on the plaster wall, the hand clothing finish of the plaster is transmitted. 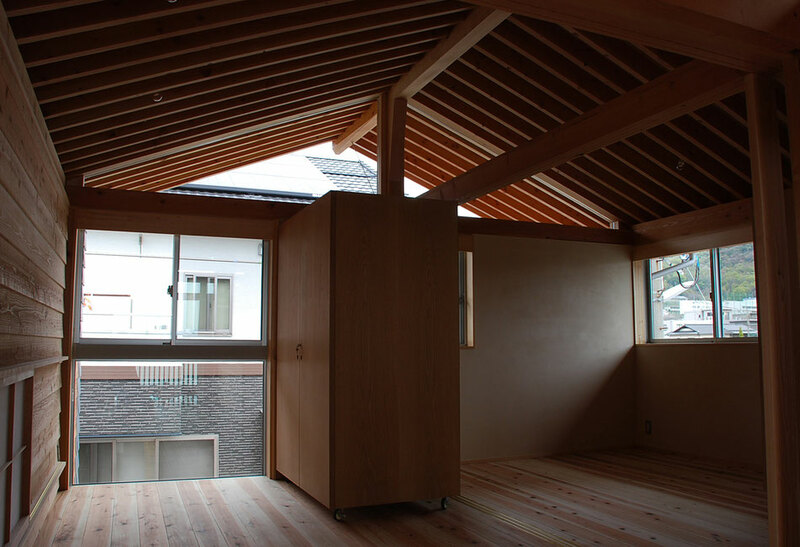 The tatami floor area is one step higher. 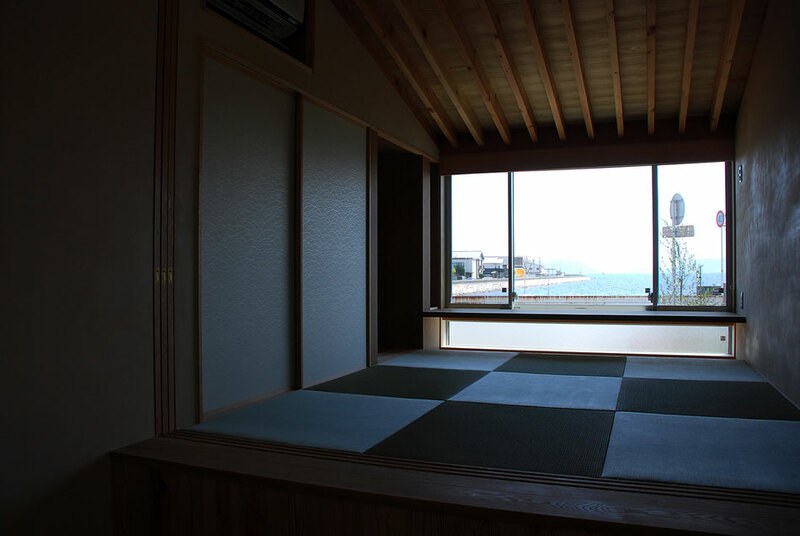 Tatami floor of the accommodation room. The sea spreads outside the window. On the window side is set a counter top plate, digging the feet and allowing you to lower your feet. 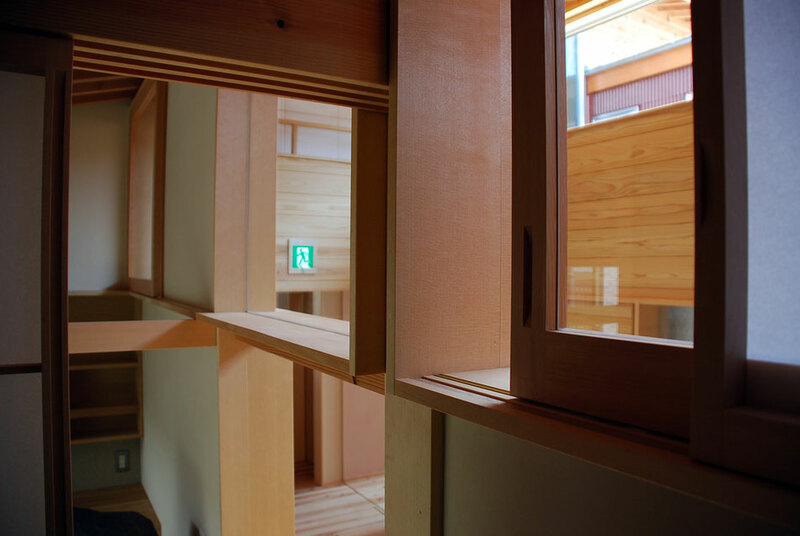 On the left side of the sliding door, three sliding doors are stored, so that you can partition the inside of the accommodation room as needed. Room wash basin. 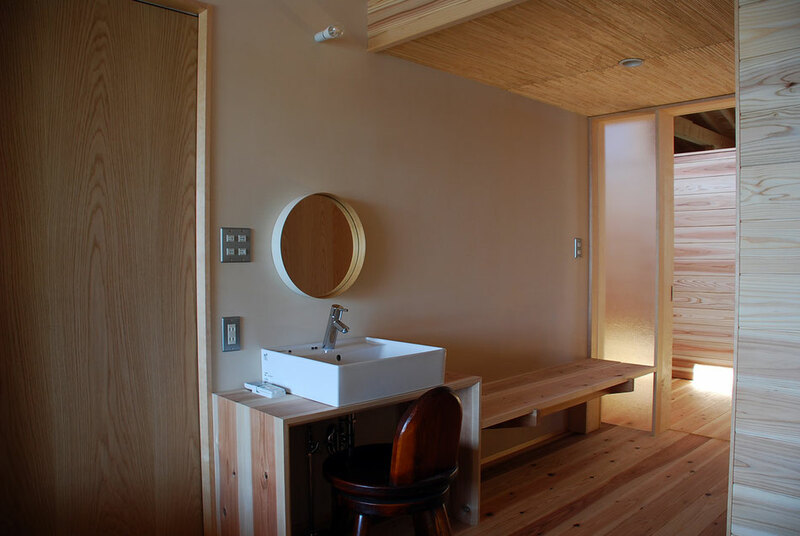 Washbasin on the right hand side is a cantilevered bench. Furthermore, a template glass between the corridor is fitted on the right hand, and the state of the corridor / the state of the room are made to feel mutually like each other. 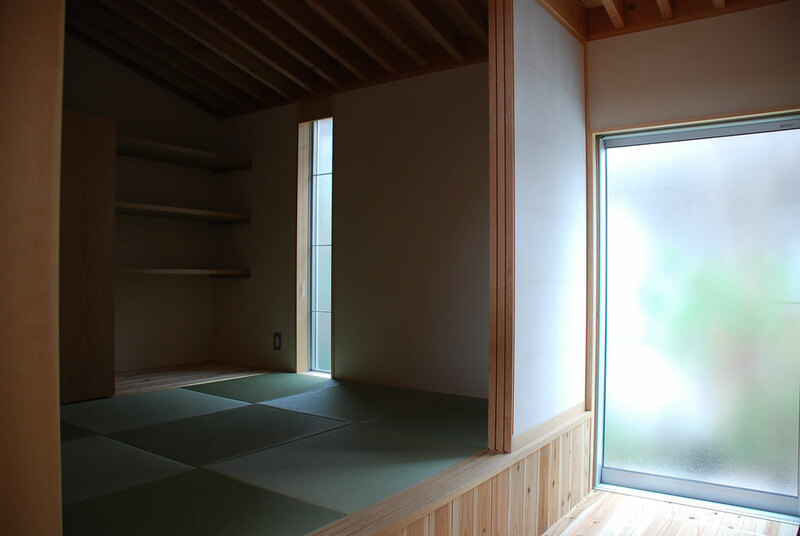 The raised left handed tatami floor is the delivery room. 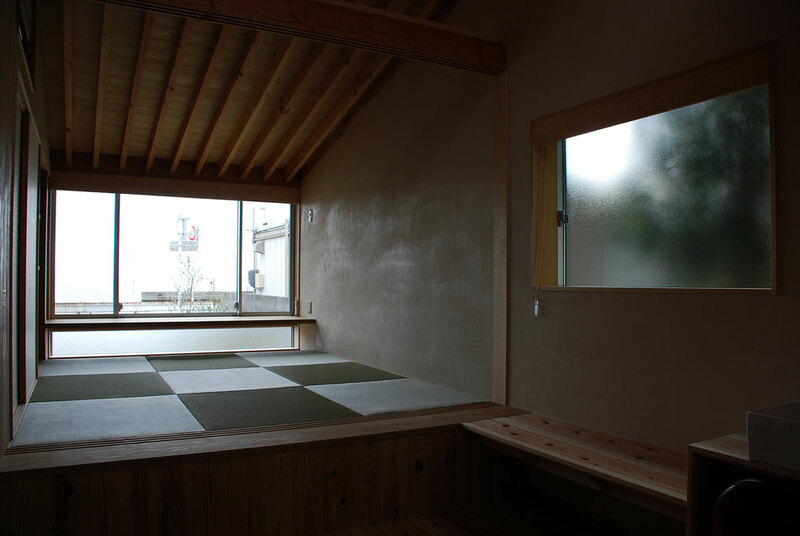 I will bring a futon on the tatami mats and we will give birth in a dimly adjusted light amount. Water circulation in the delivery room. You can partition with a curtain. There is a small window that can be opened and closed in the center of the shelf, and you can feel the sign of the person passing through the entrance. Detail of the joinery frame. 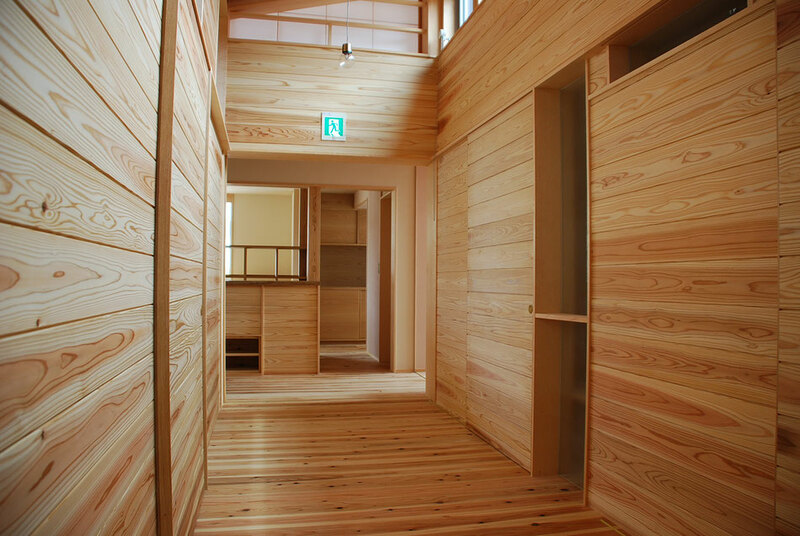 A corridor covered with cedar. Install a shoe box under the reception desk. The reception is getting small and the bottom is the storage space. 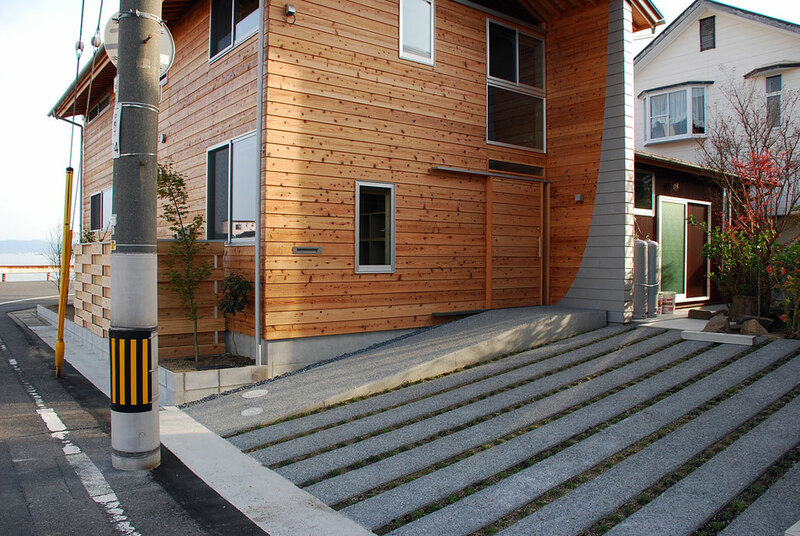 The entrance door is a sliding door. 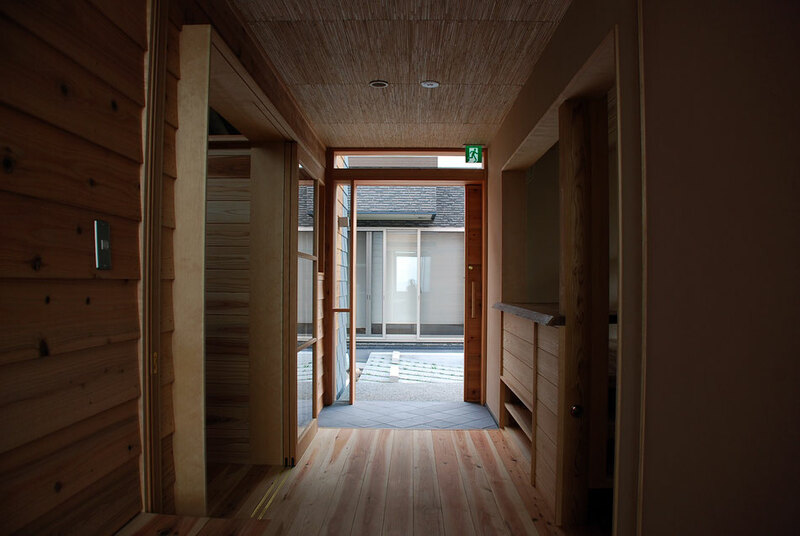 The entrance floor is an Awaji-made masonry tile. The floor is flat. Dining on the other side of the kitchen. 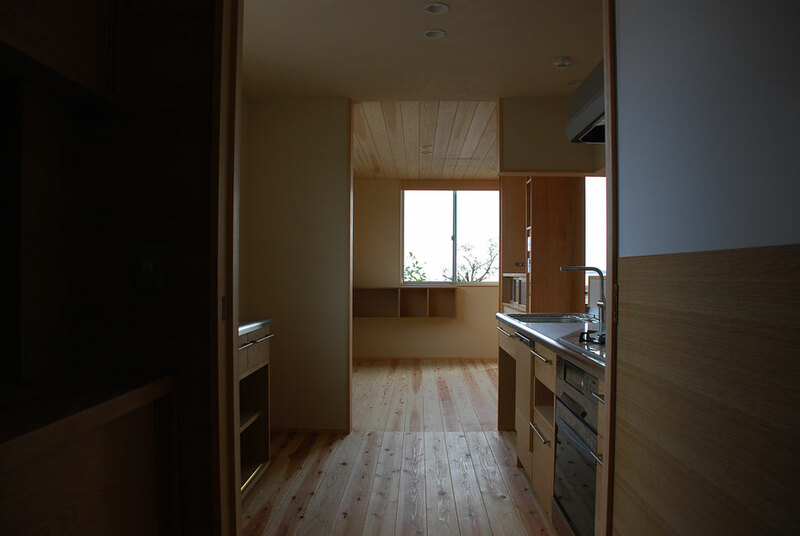 The kitchen cabinet is made and unified with other furniture and face material. On the right side of this side is the open door. The upper half is pasted with a white board with magnetic function. Main Hall. 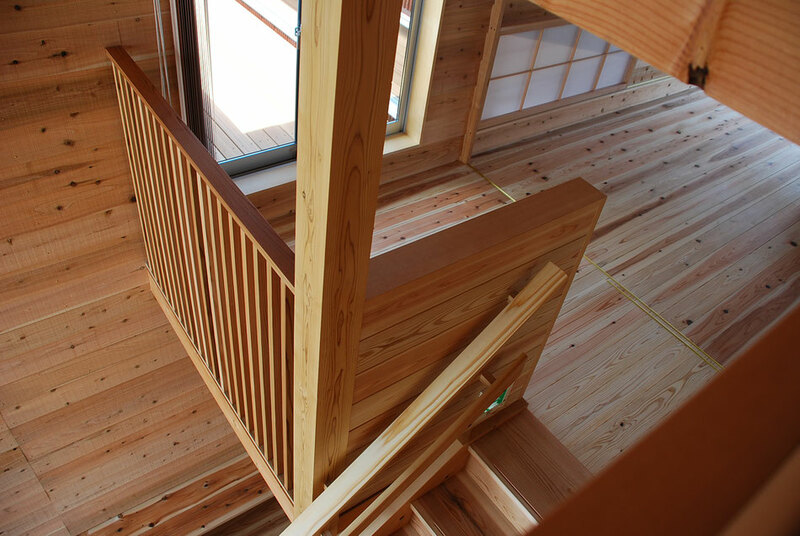 Because it is two steps higher than the peripheral floor height, the second floor is felt very close. 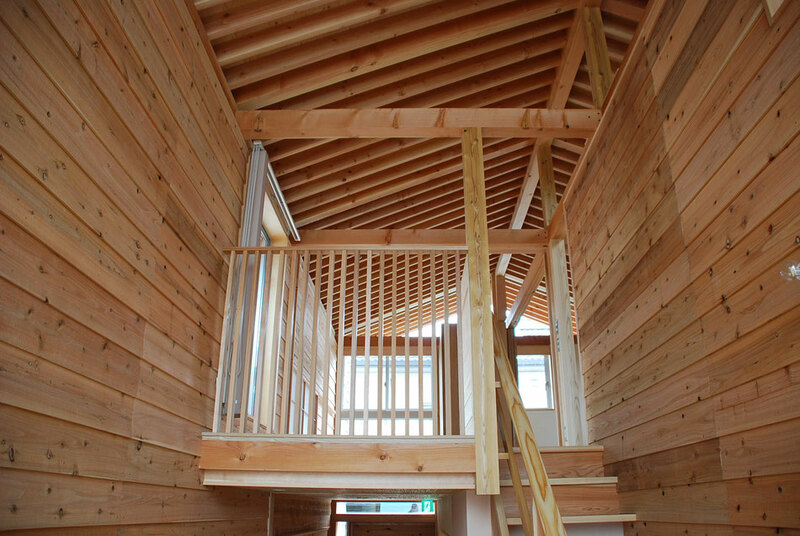 I see a continuation of rafters on the second floor. The upper central part is an entrance to the rooftop. 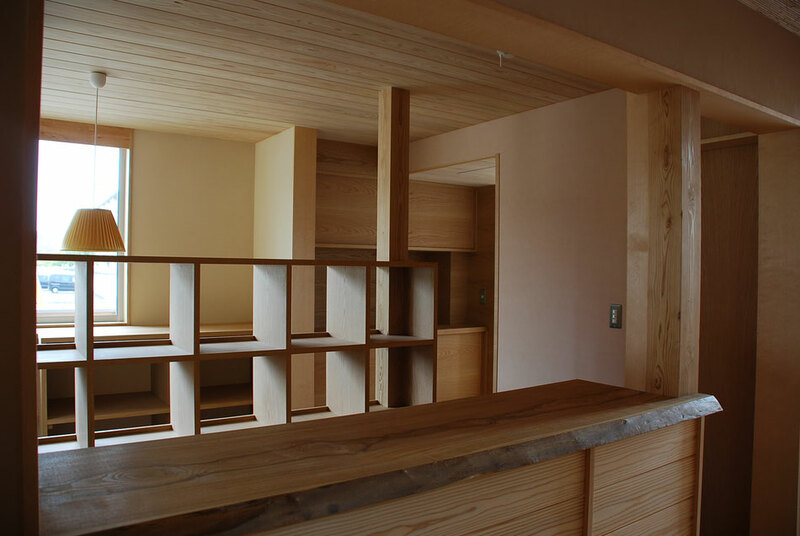 You can look down the corridor on the first floor by opening the shoji in the upper right. 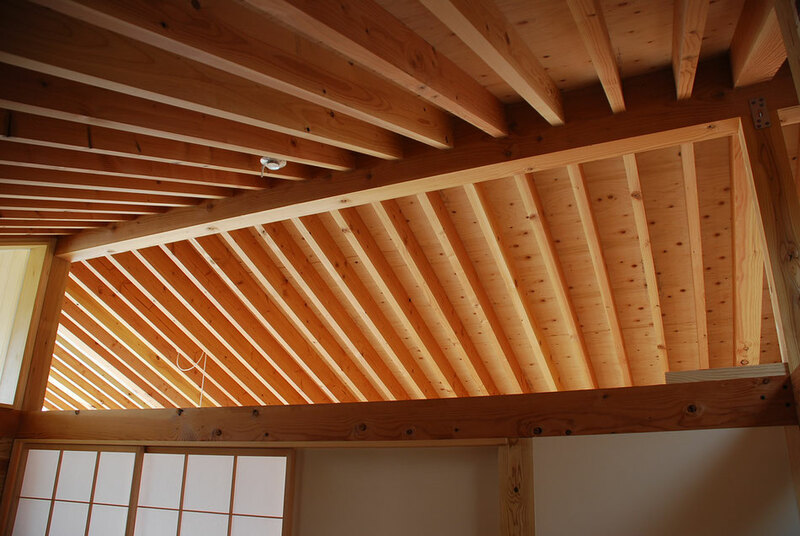 Roof rafters and beams. I dug a groove for the rail for the joiner at the lower part of the beam and also fulfill the role of the Kamoi. The roof rafters are continuous to the outside. The center is movable storage, you can move the position freely. 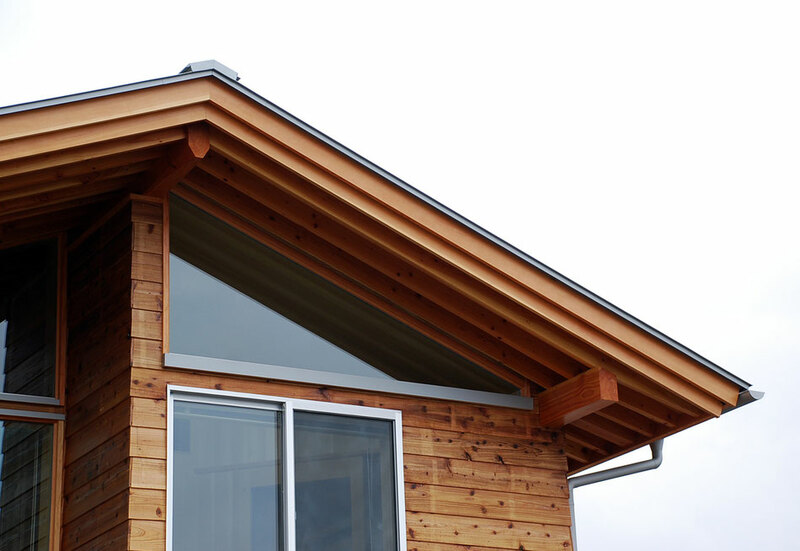 Tapered at the tip of the purlin. Massage room is in the back room. 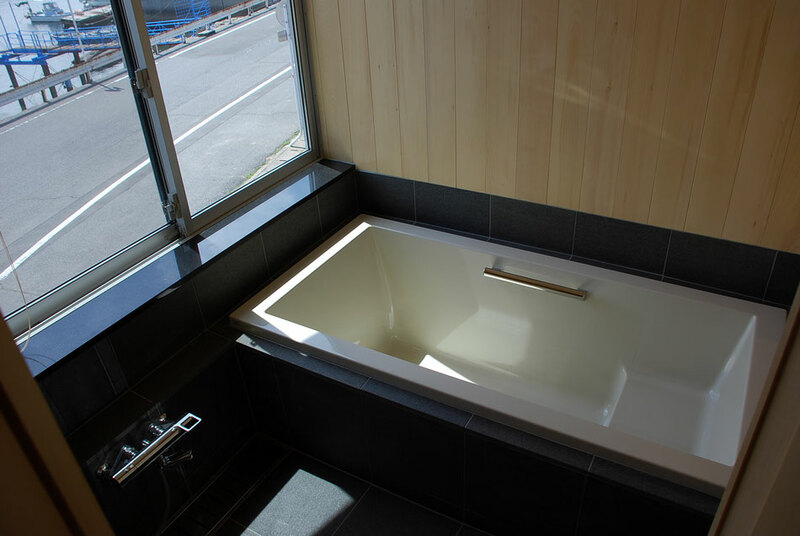 In the back is the bathroom, the upper window is visible. 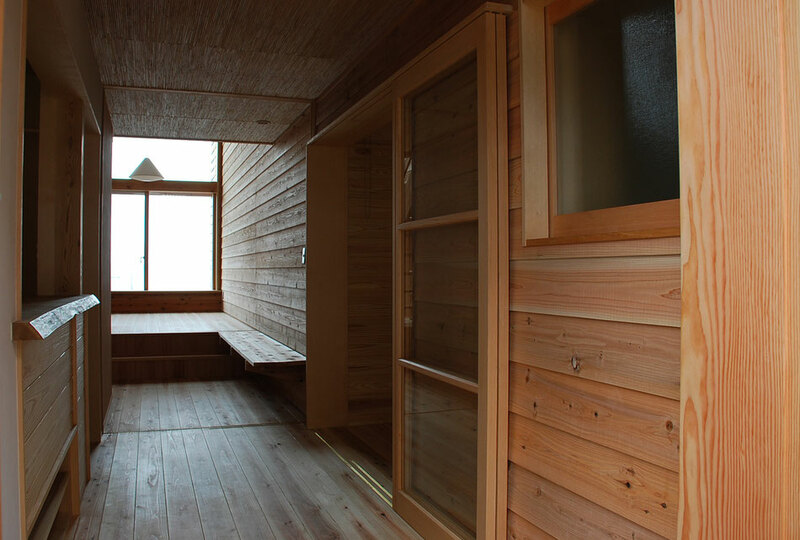 The upper side of the hut is open so that wind and light can escape. 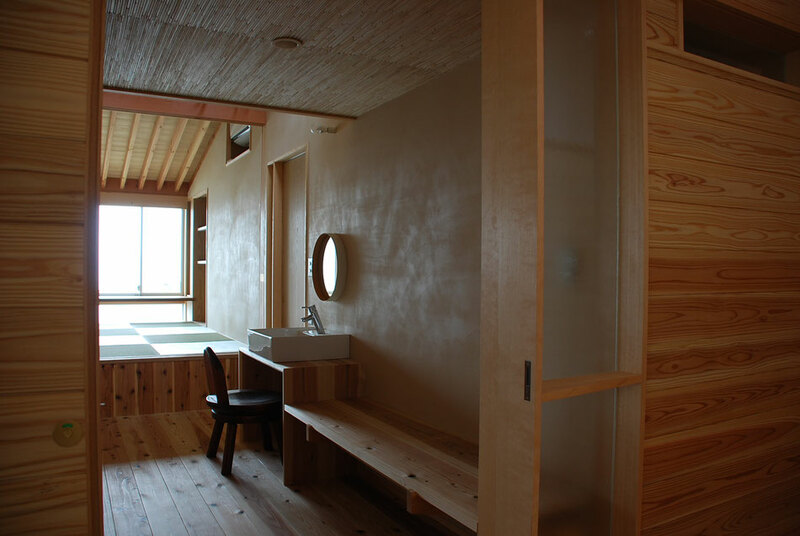 The second floor bathroom with a view of the sea. Upper waist is granite, waist upper wood panel covered. The fragrance of the tree is full. Around the north side roof. 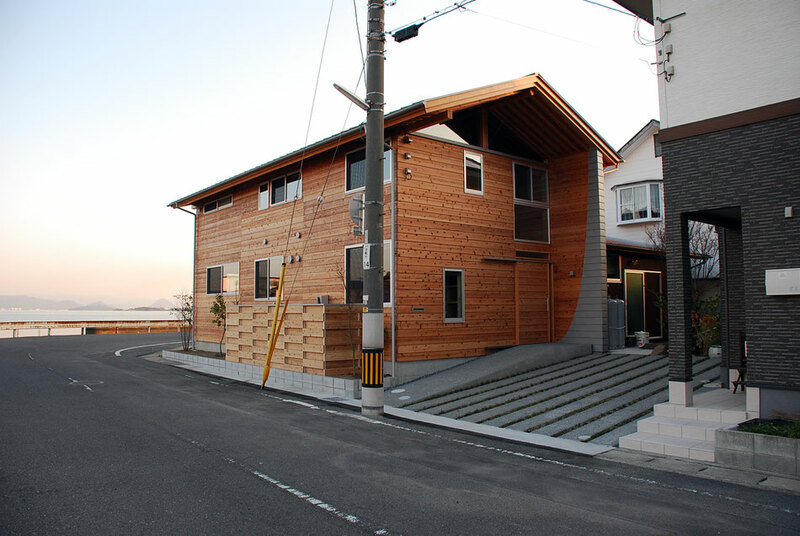 It overhangs the eaves greatly and fulfills the role of the eaves of the entrance. View from the rooftop. 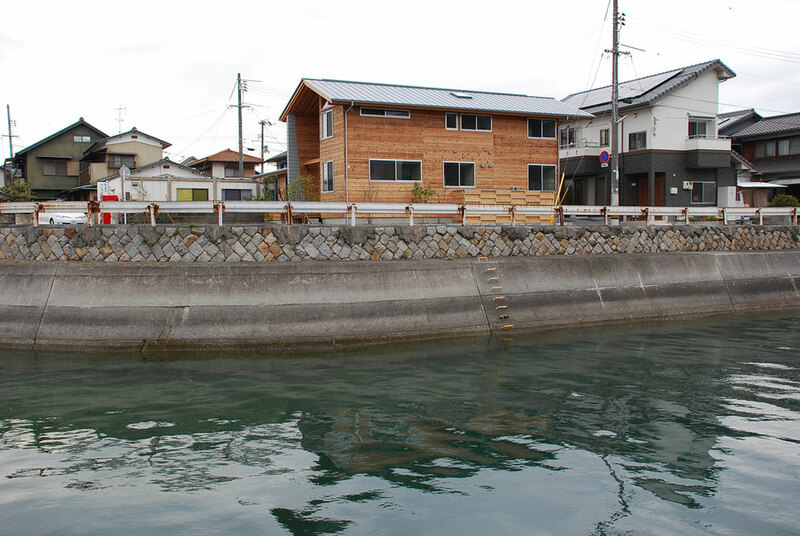 The Seto Inland Sea expands in front of you. Green of the garden shines on the sheet metal of wine red. 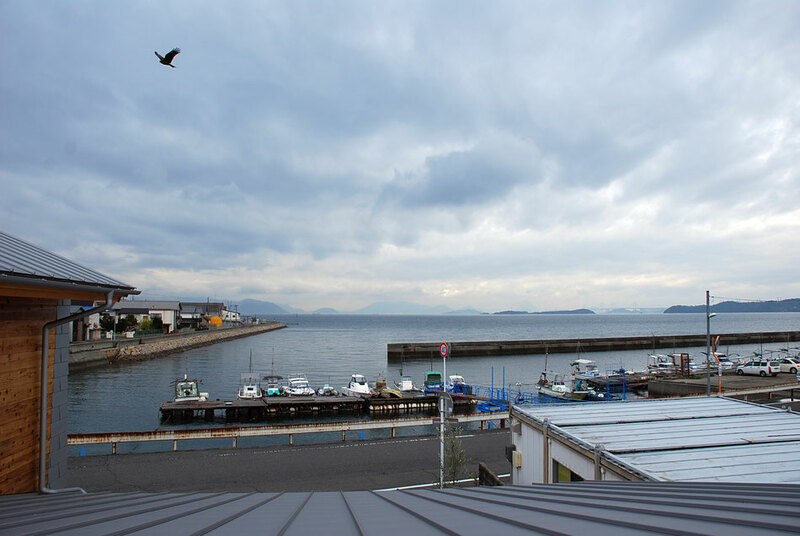 The calm sea of Seto Inland spreads out in front of me and the site of the seaside where you can wish for a chain of mountains of Shikoku at the end of that line of sight. 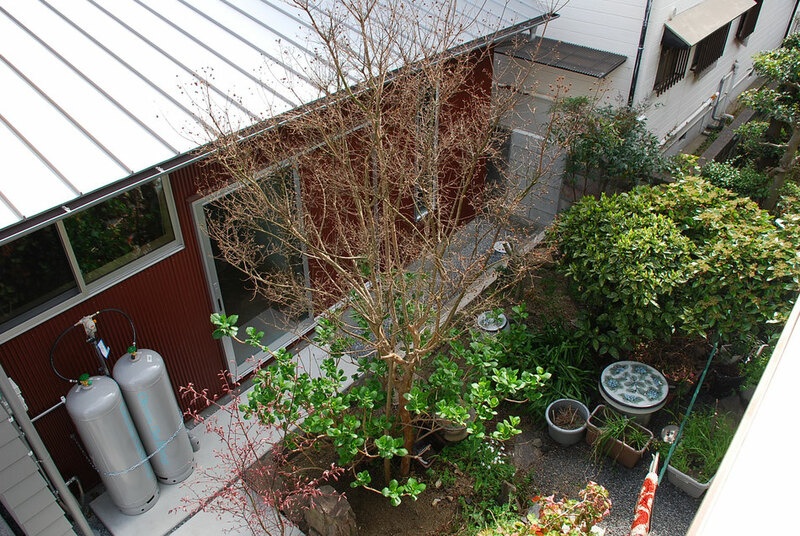 I got the design of the midwifery in Kojima, Kurashiki city which flourished in the salt making industry. Delivery in obstetrics and gynecology has become the mainstream, and opportunities to hear even the name of maternity clinic are almost gone, but every time we ask a story from a midwife master who is the owner, everything is done at the maternity clinic which supports the pregnant woman gently It is made to realize that the social role of society is rising. The midwifery center establishes support relations with major hospitals and collaborates with the city's health department to steadily practice a wide range of fine care that can not be covered by existing services in small area units. 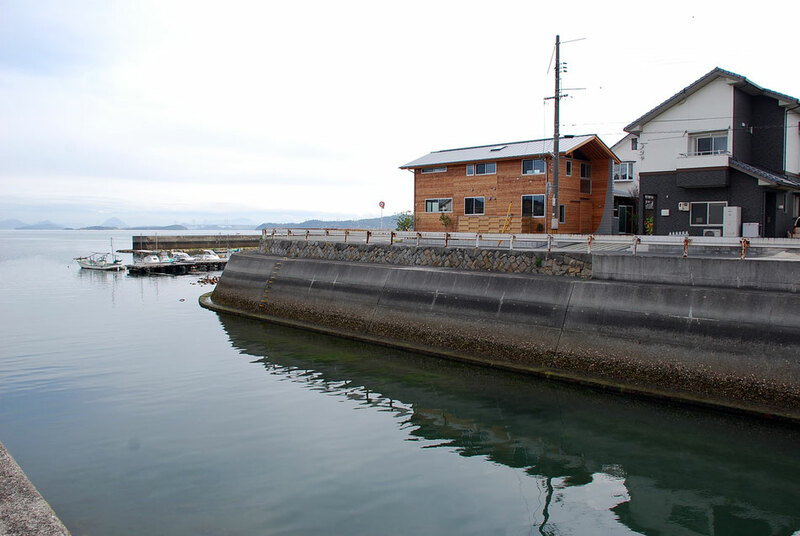 In order to raise a more fulfilling regional contribution, it was decided to newly create a new building on the sea side in the form of a separate building at the workplace adjacent to the site on the north side. 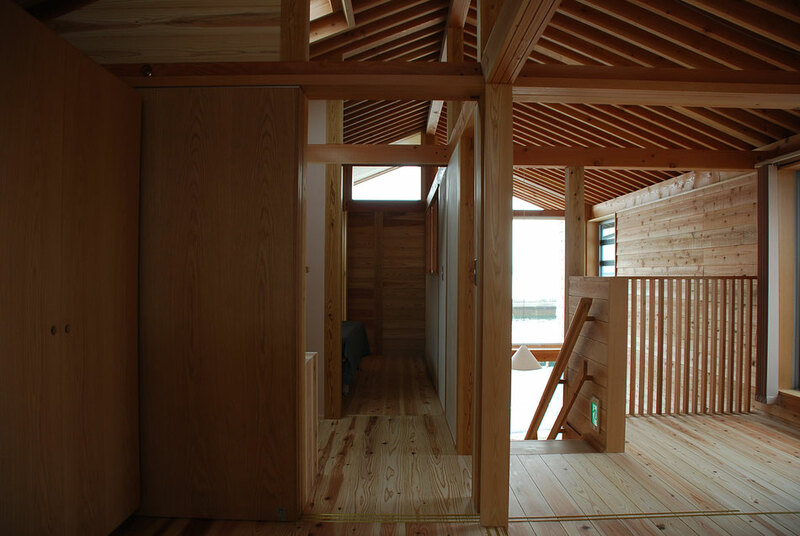 The main request from the owner was to secure to the ocean a lot of views, a calm interior with woods as the center, a bathroom in the place with the best view, and then leave it to me. 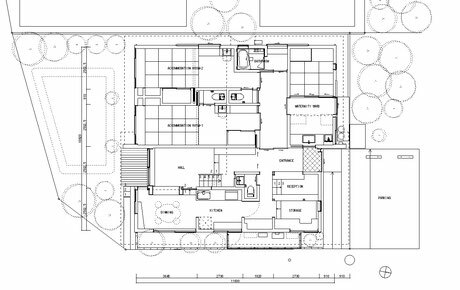 The whole composition is roughly divided into the eastern two-layer part of the gable roof and the western flat part where the entrance room and the delivery room are located, with the outbound and staff areas on the east side and the hospitalized area on the west side. 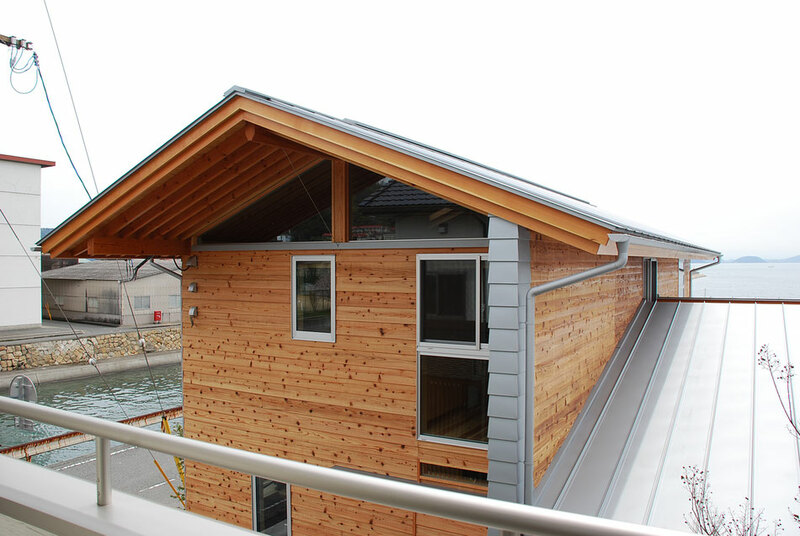 With the adoption of a simple roof shape and overhanging of the eaves, I kept trying to protect the building from rain water steadily. The wall separating the building east-west is projected in the north-south direction to visually separate the relatively moving east side and the western side where silence is necessary. Since the end of the projecting sleeve wall is easily predicted to deteriorate due to weather and rain, we wrapped the rain with sheet metal to make reasonable wood protection, while drawing a curve with sheet metal as a representation responding to the ocean. When comparing the actual rain hanging line and the curved line at the time of rain, you can confirm that the sheet metal part is well hit by the rain. In addition, by carpentry handicrafts such as carpenters seen throughout the building including the sheet metal part of the sleeve wall, we feel polite manual work of the midwives, the politeness, granularity, gentleness of work of the midwife master who is the owner, and I thought that I could express a warm personality. In the occupation of a midwife whose personality is directly reflected in work content and reputation, I think that it is necessary to express that person in whole building. 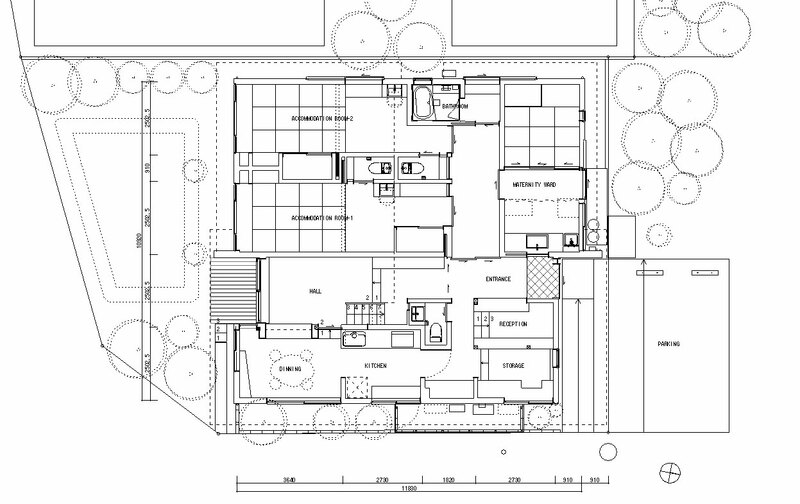 What if it was pure white modern and cool architecture? Of course, it was far from the personality of the midwife, and for the pregnant woman coming to seek relaxation it would have been a space without comfort at all. The naturally occurring material which felt warmth was mainly focused on naturally as a finishing material. 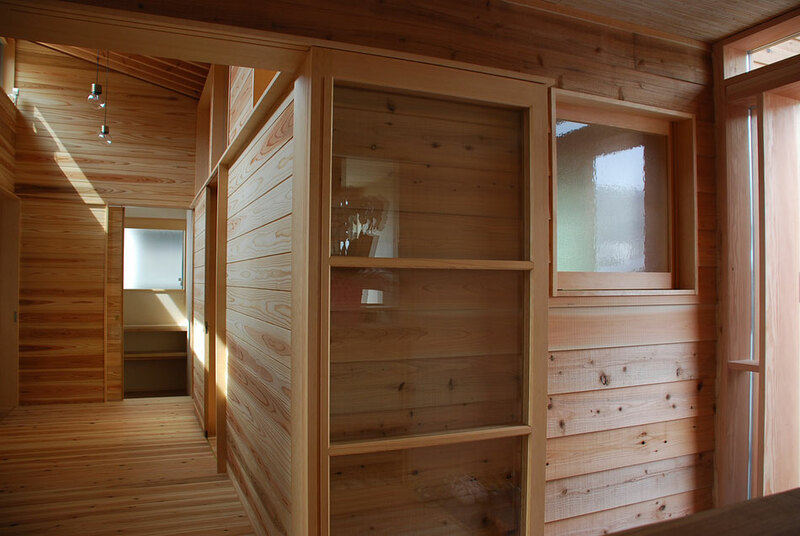 The exterior is mainly wooden pretty boarding, the interior is made of wooden board and plaster painted with soft cedar wood and plaster coating, finished in a calm atmosphere with high moisture conditioning effect by natural materials and wood scent. 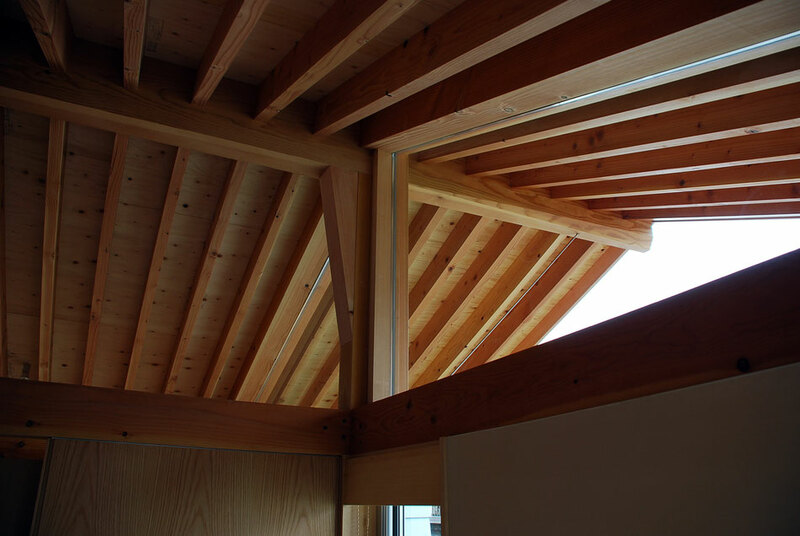 The inner hall part is made the same wooden looking boarding as the exterior, and the internal rafter and the external rafter are continued so that the inside and outside extend continuously. 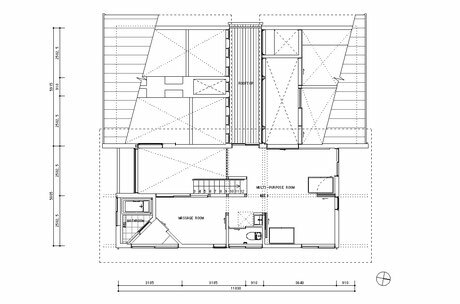 By ensuring the view from each room to the ocean as much as possible and further setting the west side as a flat shop, we can secure a view from the second floor of the workplace adjacent to the north to the sea at the same time. 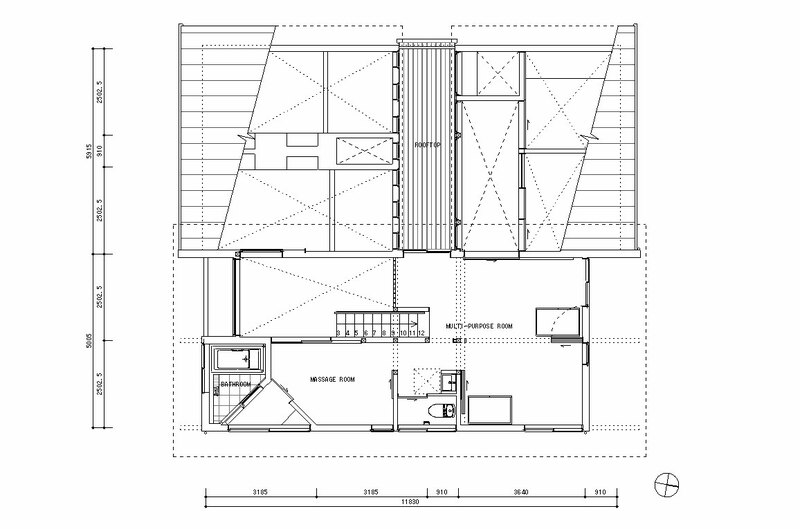 In addition, by making the upper central part of the flat store section concave, we are planning to allow daylighting and ventilation to the rooms on both sides of the North and South through the high side window.